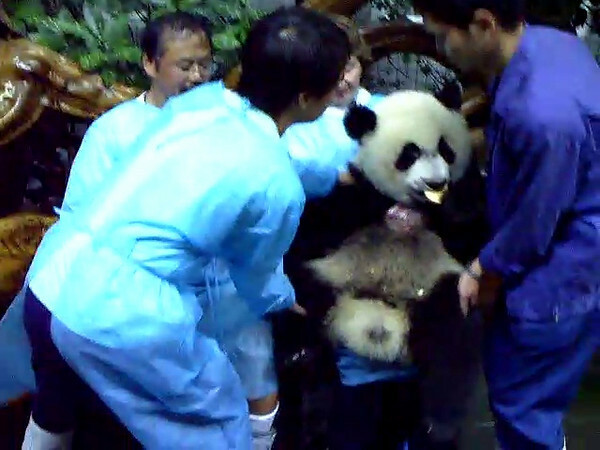 This is an one and half year old male baby Panda bear named Shuang Qing which means Double Celebration. The nice lady next to me before transferring the baby is Jean from Nantucket. The voice you are hearing is Klangchol (Pipe) Suwanmongkol who is taking still pictures with my D3. You have to make a "donation" of 1000 Yuan(= $150.00) to have the baby in your lap. It was worth every second! Oh, and thanks to the woman(one of the bear handlers) who operated my camcorder. I gave her a crash course on how to use it in less than 20 seconds. As you can see, she did it right!